Adam Whytall: ProMobileDJ.com – what’s not to like? With industry leaders and cutting edge professionals contributing valuable content on everything related to the industry, it is a must read for me daily. Antonio DJTone Pascal: This is like a DJ hub start here and you should find all of you business needs. Bill Murray: You cover Everything Mobile DJ’s could ever ask for. The Latest Gear to, How To run Your DJ Company. Plus I think that anyone that has “Ben Stowe” writing articles for them. can’t be all that bad…LOL…. Bob Grandchamp: Good links, articles, and plenty of great ideas. Absolutely the best source for equipment info., new music, and other general DJ info. in one place! !!! Brett Friedman: I love promobileDJ.com – so many great tips, and advice. I log on everyday to read something or watch one of the great videos just to keep things fresh in my mind! Bruce Robinson: For me, the most useful parts of ProMobileDJ have been the explanations from other practitioners, the how-tos, if you will. As a program DJ, not everything is applicable to me, but I learn from all of the articles and discussions. Bud Baughman: I am just getting into DJ-ing again and needed some fresh tips and tricks to help and have found many helpful ideas from this site. Thank you! Chris Peasley: I really like the info that is put out there for us to read…it has helped me a lot in the past months! Thanks! Dave’s DJ Service: I like the great informed articles written by DJs for DJs. Debbie Dodd-Hampton: I learn something new each time I read your info…I wanna come back for MORE! DJ-James Jacobs: I am glad there is a site like this dedicated to “Mobile DJ’s” keep up the good work and thanks. Fred Griggs: great site and very helpful articles keep me coming back. keep them coming. Geoff Carlisle: A great place to share, learn & discover things that will help your DJ business. Bob Holl: ProMobileDJ is..Educational, Informing, & FUN! I enjoy learning from fellow entertainers from around the country as they share their expertise and knowledge about the world of mobile Djing! Dan Carpenter: What I like best about Pro Mobile DJ is the articles (boy that sounded cliche). I like that I can read up on something quick and gives me pointers along the way. I also like the useless information that are often thrown in from Promo Only… just because I like weird info from time to time. David DJ-Chaos Lamoreaux: When you have your own business, you can never have too many resources. If you were only going to have a couple though, this is definitely one of the best to have. The range of information in the articles have been very informative and helpful. 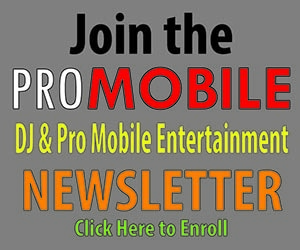 Eric L. Pickett: Pro Mobile DJ helps give me information to further my business from different angles. Often people forget it is a business and you have to treat as such. They help cover from the business end to the service delivery part. There is a side angle of wanting money for this or that. Thank you for being what you say you are. Jake Palmer: I like the fact that you cover multiple bases, not just music, or gear, or sales, but a nice mixture of every aspect of our industry and business, no matter what I have questions or want input on you have it covered!!!! keep up the great work! James Owens: OK this is a GREAT site. When I saw the pyramid of Success from Coach John Wooden it brought back years of memories as I have an original signed by Mr Wooden that was in my office for years. It is so true of life that you can apply all the lessons we have learned as athletes or just education. I you are willing to just work a little harder you can get everything you want. The difference between Ordinary and Extraordinary is just the little extra. Jason Sablan: I really value the articles about improving ourselves as a DJ. It has helped me a lot!!!! Jim Hall: Lots of great info…Articles, tips, and tools to help us all be better at what we do! Jim Poulson: I like the promo ideas and focus on the business not just the technology we use. Joni Johnson-Kropp: Wow! I am so glad I found this page!! What great tips and info…THANKS! Kasey Keller: Pro Mobile DJ has helped my business out by providing excellent articles to assist and motivate us DJ’s to take it to the next level! Kevin Baker: being a DJ myself and having a love for it since a kid…to have incredible quality resources to draw from adds so much to what I do. Very thankful for all Pro Mobile DJ has to offer. Lawrence Krewer Jr.: I find the site to be entertaining, as well as informative. I enjoy the simplicity of the site, and the content is well structured…. good reviews of hardware, and no overkill on each subject. Thanks! Loby Scott Lobins: I enjoy reading the interesting articles, and think the ideas are great! Mark Williams: lots of available information. Matthew Jones: I really like all the business tips you post. I’m always looking for a way to improve my biz! Patrick Milligan: Love all the info that is posted. It helps in so many ways. Peter Lock: i like the fact that you cover all aspects of the mobile disco industry with impartial information. Peter Ticali: I like that the site pulls together industry leaders to archive their collective experience in most every topic a DJ could experience. Richard Gallant: I enjoy the tips and articles. Rick Styles Schunk: I enjoy the ideas and other jocks input! Rob TheDeejay Bass: Sorry I cannot improve upon perfection. Robert Goff Weddings: Every newsletter I find something that I can use in my business to make my clients happy and me better at what I do! Robert Thigpin: The articles are the best part. Rodrigo Windycitymix Alvear: I really like the information that is put out there for us to read…it has helped me a lot! Ron Vroman: I like Everything about ProMobileDJ. I truly believe all the articles you have posted have made me a better DJ and able to run a more productive company! Scott Groszczyk: I love the articles news feeds the how to’s and marketing idea’s.How I can better myself as a DJ I have been in this business and we are learning something new all the time. Steve Skeeter Slater: For years I wondered, Am I doing this right and how can I better myself? Then I found ProMobileDJ.com and learned that what I was doing was what you said should be done. So to wrap this up, Thank You for helping me realize that I’m on the right track on making my DJ business a great success! Sue TheDJ: I’d like the articles and tips… I don’t have to just pick one, right? Susan Ransom Bedke: Love the articles and wealth of knowledge. Tamara Lynn Banning Jilek: First time visiting this site but the tips are great! Todd Jakovec: I like how you help small time entertainers find the tools and advice they need to help launch their businesses,and help them to stay lucrative and marketable in such a fast paced trade-the DJ Biz! Ron Vroman: I like Everything about ProMobileDJ. I truly believe all the posts and article you have posted has made me a better DJ on the business end and more sucessful overall, and for that I thank you!!!!! Vince Zerafa: Pro Mobile DJ has helped me with some great ideas for DJing!! Thanks for all your help and keep up the great work! !